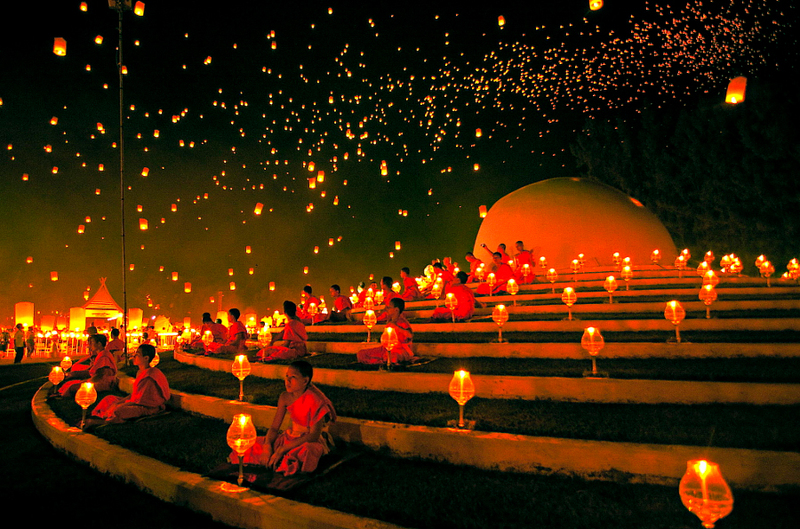 Every year there’s a special event across Thailand that we know in English as the Festival of Lights. It’s a time for people to celebrate and come together under the full moon in November. The exact origins entail at least seven legends all with their own unique story and purpose, but in the end the Festival of Lights is a celebration of life and fortune. Chiang Mai has been host to some of the biggest Yee Peng and Loy Krathong festivals for generations and it grows in popularity every year. If you’re traveling through Thailand or visiting just to witness Yee Peng or Loy Krathong – or both – then Chiang Mai is going to be your best bet for a truly spectacular experience. Loy Krathong is a Thailand national celebration to Buddha and it’s marked on the full moon in November as a ceremony to release all your wrong desires and bad deeds for Buddha to carry away from you. A Loy Krathong ceremony involves the lighting of decorative floats and placing them in the river to be floated down stream. These floats come in all shapes and sizes, but most commonly look like lotus flowers made of wood or leaves from the banana tree with decorations of flowers, candles and incense. These floating offerings – or krathong – will sometimes carry small coins, a lock of the maker’s hair or their nail clippings as gifts to Buddha. The reasons for the krathong and sailing them down river has varied origins, one being explained as a way to honour the footprint Buddha left behind on the shore of the Narmaha River in India along with the Great Serpent and his underwater denizens after Buddha visited them. The krathong decorated with flowers has been described as an offering to the pagoda containing Buddha’s topknot, which was cut at his self-ordination. Loy Krathong is thought to date back further and has origins relating to a Hindu festival that paid tribute to the god Vishnu who is depicted as meditating at the divine centre of the ocean. By releasing their offerings in rivers, servants of Vishnu hoped he would receive them as they believed all rivers led to him. Loy Krathong’s origins are indeed mysterious and have ties to multiple religions and legends. On a personal level, people in Thailand believe the Loy Krathong festival to be a time to give honour to their ancestors and offer prayers to them in return for blessings and guidance. Whatever reason people have for celebrating this beautiful holiday, they all come together in Chiang Mai for the experience. The city adopted the Thai Loy Krathong festival after receiving Queen Dara Rasami (formerly a Lanna Kingdom resident, of which Chiang Mai was Lanna’s capital), wife of King Rama V, from Bangkok back to Chiang Mai. It was in Chiang Mai that she offered a krathong into the Ping River. It has been a cherished event since and shares honour with the Northern Thailand celebration of Yee Peng, a Lanna Kingdom festival. In sharing these observances, not only can you experience the beauty and elegance of Loy Krathong, but you’re able to see Chiang Mai’s Yee Peng festival at the same time. Yee Peng is held for similar reasons as the Thailand national festival, but is exclusive to the northern territory. Instead of setting floats down river, Yee Peng offers their floats to the full moon above. These floating lanterns – or khom loy – also take away misfortune and bad tidings as they disappear into the night sky. Combined with Loy Krathong, the festivals in Chaing Mai light up the city with candles on the water and in the heavens, casting a beautiful illumination wherever you go during your visit. The khom loy are cylindrical paper floats held up by wire with a tray at the bottom containing cotton soaked in kerosene. Once lit, these lanterns fill the sky upon release and carry the thoughts, prayers and offerings of thousands of people. Some people even attach firecrackers to their lanterns for excitement and creativity. Like krathong, others attach coins along with well-wishes of fortune as their lanterns will eventually fall back to the earth. The idea is that when someone finds the lantern, they will also find money with it and good fortune will be spread. In Chiang Mai, both festivals last for three days with related events through the following week. For Loy Krathong, the night prior to the full moon is known as Loy Krathong Lek while Loy Krathong Yai is the night of the full moon. Both nights are similar in observance, but in Chiang Mai the focus is the togetherness of the community. Meeting new people and attending parties is a perfect way to spend Loy Krathong and Yee Peng in Chiang Mai as you get to make new connections, new friends and enjoy the customs of locals. There are also plenty of vendors selling specialised khom loy and krathong for the festival or if you want a traditional experience, there are plenty of people who teach you how to make your own. There are hosts of other related events, such as the Mae Jo University mass lantern launch. It’s not in Chiang Mai, but if you want to experience thousands of people releasing khom loy all at once, it’s much more preferable to stay in Chiang Mai and travel as the traffic can get nasty around the university. Chiang Mai has a beauty contest as well that is preceded by the Loy Krathong parade that begins at Tha Pae Gate the first evening of the festival. The temples also feature their own private celebrations where the devotees release khom loy and float their krathong and they welcome visitors to share in this deeply intimate event. If you’re in Thailand in November or you’re looking forward to the celebration itself but don’t know where to go, make sure you end up in Chiang Mai. The atmosphere is great, both festivals have a special place in the history of the city and it will make for a personal and pleasant experience. The staff at our Chiang Mai Hotel are waiting to welcome you. Our suites are perfectly appointed to pamper you. Akyra suites are elegant, with bathtub balconies and private courtyards. In-room amenities include plush robes, comfy slippers, and lavish towels. Cozy up with luxurious linens. Unwind with natural toiletries. Enjoy the convenience of a fully-stocked mini-bar, the delight of a stellar entertainment system, and the perks of your own espresso coffee machine. Manor suites are especially spacious, with walk-in closets and expansive bathrooms. There’s plenty of room for a family of four.